Lebanon’s presidential battle has been a bit quiet for the past few weeks, so I thought that it would be a good idea to start 2015 with a throwback to the 1998 presidential elections. Here’s an interesting WikiLeaks cable I found on the election of Emile Lahoud. 1. (U) CLASSIFIED BY AMBASSADOR DAVID M. SATTERFIELD. REASONS 1.5 (B AND D). 2. (C) SUMMARY: RATIFYING THE NAME WHICH EMERGED FROM LAST WEEK’S SUMMIT BETWEEN LEBANESE PRESIDENT HRAWI AND SYRIAN PRESIDENT ASAD, THE LEBANESE PARLIAMENT TODAY ELECTED LAF COMMANDER EMILE LAHUD AS LEBANON’S ELEVENTH PRESIDENT BY A QUASI-UNANIMOUS VOTE OF 118 (AND 10 ABSTENTIONS). WHILE UNDER PRESENT CIRCUMSTANCES NO PRESIDENT COULD BE CHOSEN WITHOUT DAMASCUS’ BLESSING, LAHUD APPEARS TO BE A GENUINE NATIONAL CONSENSUS CANDIDATE — WITH MOST LEBANESE TAKING HOPE FROM LAHUD’S REPUTATION AS THE CORRUPTION-FREE REBUILDER OF A DECONFESSIONALIZED NATIONAL ARMY AND ABOVE ALL, A LEADER FROM OUTSIDE THE LARGELY DISCREDITED POLITICAL CLASS. WITH MONTHS OF FEVERED SPECULATION OVER THE IDENTITY OF THEIR NEXT PRESIDENT NOW ENDED, AN EQUALLY INTENSE FOCUS WILL NOW TURN ON LAHUD’S POLITICAL PROGRAM AND THE COMPOSITION OF THE NEXT GOVERNMENT. LAHUD AND HIS SOON-TO- BE COLLEAGUES IN THE TRIPARTITE PRESIDENCY, PM HARIRI AND SPEAKER BERRI, WILL UNDOUBTEDLY HAVE THEIR OWN IDEAS ABOUT THE NEW GOVERNMENT SHOULD RUN — AS WILL DAMASCUS. EXPECTATIONS OF POSITIVE CHANGE ARE RUNNING HIGH HERE, AS IS SKEPTICISM OVER WHETHER ANY OF THE PARTIES CONCERNED TRULY WANT TO SEE SUCH CHANGE TAKE PLACE. OUR CONTINUED PUBLIC AND PRIVATE EMPHASIS ON STRENGTHENING LEBANON’S INSTITUTIONS AND GOOD GOVERNANCE WILL BE IMPORTANT, BUT WHETHER LEBANESE (AND OUR OWN) HOPES WILL BE FULFILLED REMAINS VERY MUCH TO BE SEEN. 3. (C) MONTHS OF INTENSE SPECULATION AMONG LEBANON’S POLITICAL ELITES REGARDING THE IDENTITY OF THE NEXT PRESIDENT OF THE REPUBLIC WERE ENDED WITH THE ANNOUNCEMENT LATE ON OCTOBER 5 — FOLLOWING PRESIDENT HRAWI’S SUMMIT WITH SYRIAN PRESIOENT ASAD — THAT ARTICLE 49 OF THE LEBANESE CONSTITUTION WAS TO BE AMENDED TO PERMIT SENIOR GOVERNMENT OFFICIALS (LAF COMMANDING GENERAL EMILE LAHUD, FOR EXAMPLE) TO BE ELECTED PRESIDENT. WHILE HRAWI CERTAINLY WAS SEEKING ASAD’S APPROVAL FOR AN AMENDMENT TO ARTICLE 49, IN HIS CASE TO PERMIT ANOTHER EXTENSION IN OFFICE, THE GENERAL CAME AWAY THE WINNER. 4. (C) COMMENT: ARTICLE 49 WAS ADDED AT THE TIME OF THE TAIF ACCORD TO PRECLUDE THE POSSIBLE CANDIDACY OF THEN (REBEL) LAF COMMANDER LTG MICHEL AOUN. 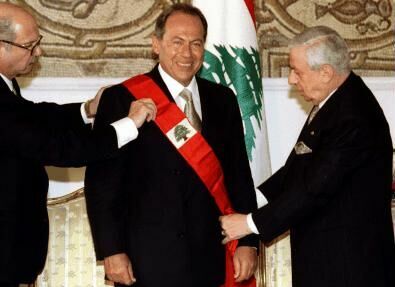 IRONICALLY, TODAY’S VOTE COINCIDED WITH THE ANNIVERSARY OF AOUN’S FORCED DEPARTURE FROM LEBANON’S PRESIDENTIAL PALACE AT THE HANDS OF THE SYRIAN MILITARY AND THEIR LEBANESE ALLIES (EN ROUTE TO ULTIMATE EXILE IN FRANCE) ON 13 OCTOBER 199O. AOUN TOLD THE PRESS IN PARIS THAT HE IS PREPARED TO RETURN TO LEBANON SHOULD LAHUD MAKE THE REQUEST — AN UNLIKELY SCENARIO. END COMMENT. 5. (C) ACTING IN RECORD TIME AND WITH A VIGOR USUALLY UNKNOWN HERE, PRESIDENT HRAWI AND THE COUNCIL OF MINISTERS PROMPTLY SENT TO THE PARLIAMENT THE REQUISITE AMENDMENT OF ARTICLE 49 WHICH WOULD PERMIT “FOR ONE TIME ONLY” AND ON AN EXCEPTIONAL BASIS THE CANDIDACY OF A SENIOR CIVIL SERVANT. MP BOUTROS HARB, A MEMBER OF THE JUDICIAL AND ADMINISTRATIVE COMMITTEE OF PARLIAMENT AND A DECLARED PRESIDENTIAL CANDIDATE, VOTED AGAINST THE AMENDMENT IN COMMITTEE. LEGAL ANALYSTS, INCLUDING A MEMBER OF LEBANON’S CONSTITUTIONAL COUNCIL, TOLD EMBOFFS THAT THE DEBATE CENTERED ON WHETHER THE ONE-TIME EXCEPTION CLAUSE PROPOSED BY HRAWI WAS SUFFICIENT TO NULLIFY THE REQUIREMENT, EMBODIED IN LEBANESE ELECTORAL LAW, THAT THE CANDIDATE MUST HAVE BEEN OUT OF ACTIVE MILITARY DUTY FOR AT LEAST SIX MONTHS. SINCE THE AMENDMENT WAS NOT SUBJECT TO REVIEW BY CONSTITUTIONAL COUNCIL, THE POINT BECAME MOOT (ASSUMING THAT, UNDER THE CIRCUMSTANCES, CONSTITUTIONAL SUBSTANCE AS OPPOSED TO FORM WAS EVER AT ISSUE) WHEN THE PARLIAMENTARY COMMITTEE APPROVED IT ON 12 OCTOBER. 7. (U) MP NASSIB LAHUD, AN UNDECLARED CONTENDER FOR THE PRESIDENCY, ARGUED FOR SIMPLY ABOLISHING THE PROBLEMATIC CLAUSES OF ARTICLE 49 RATHER THAN ADD A “ONE-TIME ONLY” PROVISION WHICH IN HIS VIEW WEAKENED THE CONSTITUTION. “BY AMENDING THE CONSTITUTION FOR ONE TIME ONLY AND EXCEPTIONALLY ON THE EVE OF EVERY PRESIDENTIAL ELECTION, IS A STATE OF LAW AND INSTITUTIONS BEING BUILT?” HE TOLD THE PRESS (A SENTIMENT OTHER POLITICIANS AND ANALYSTS HERE HAVE EXPRESSED TO US PRIVATELY.) HOWEVER, LAHUD, ESTRANGED COUSIN OF EMILE, SUBSEQUENTLY INDICATED HIS INTENTION TO VOTE FOR THE GENERAL. 9. (C) WHILE MOST LEBANESE RESENT SYRIAN DIRECTION OF THE ELECTORAL PROCESS AND THE HASTY CONSTITUTIONAL AMENDMENT, THERE IS NEAR (AND TO US GENUINE) CONSENSUS SUPPORT FOR GENERAL LAHUD AS LEBANON’S NEXT PRESIDENT — AND AS A CATALYST FOR MUCH-NEEDED CHANGE. THERE ARE EXCEPTIONS AND CAVEATS IN THIS SUPPORT, HOWEVER. JUMBLATT AND HIS DRUZE ALLIES REMAIN DEEPLY SUSPICIOUS OF THE MILITARY AND HIS RELATIONS WITH LAHUD CAN BE EXPECTED TO BE (AT BEST) PROBLEMATIC. WHILE MOST MARONITES SEE LAHUD AS AMONG THE BEST OF THE POSSIBLE CANDIDATES (THEIR HEARTS WERE WITH NASSIB LAHUD OR BUTROS HARB) AND FAR SUPERIOR TO THE LIKES OF JEAN OBEYD OR ELIE HOBEIQA, THERE IS A RESERVOIR OF CONCERN THAT SYRIA WILL NOW DICTATE THE CHOICE OF LAHUD’S SUCCESSOR IN THE LAF AND WILL THUS HAVE BOTH THE PRESIDENT AND ARMY CHIEF BEHOLDEN TO THEIR WILL. 10. (C) ALTHOUGH FORMER PRESIDENT CHARLES HELOU TOLD THE AMBASSADOR ON 14 OCTOBER THAT HE VIEWED A LAHUD PRESIDENCY WITH GREAT OPTIMISM, MANY FROM HIS POLITICAL GENERATION RECALL THE REIGN OF PRESIDENT FOUAD SHEHAB (ALSO LAF COMMANDER BEFORE HIS ELECTION) WHOSE USE OF THE LAF G-2 TO MONITOR AND SHAPE POLITICAL DECISIONS WAS WIDELY RESENTED AND FEARED. DESPITE SUCH RESERVATIONS, FROM HIZBALLAH TO THE MARONITE LEAGUE, LAHUD HAS A WIDE BODY OF SUPPORT ACROSS CONFESSIONAL LINES AND AMONG THE CHRISTIAN COMMUNITY. KEY LEADERS IN THE PRESENT GOVERNMENT, NOTABLY PM HARIRI, HAVE BEEN QUICK TO PLEDGE PUBLICLY THEIR DESIRE TO COOPERATE WITH THE NEW PRESIDENT. 11. (C) THE UNANSWERED QUESTION HERE IS WHAT, PRECISELY, THE NEW PRESIDENT INTENDS TO DO WITH THIS SUPPORT. LEBANON FACES A VARIETY OF SIGNIFICANT CHALLENGES: THE NEED FOR URGENT ECONOMIC REFORMS, AN ALMOST WHOLLY DISCREDITED AND CORRUPT SPOILS SYSTEM OF GOVERNMENT AND CONTINUING DRIFT IN SEARCH OF A NEW, POST-CIVIL WAR IDENTITY AND SENSE OF NATIONHOOD. NOT ONE OF LEBANON’S MANY POLITICIANS, ECONOMISTS OR JOURNALISTS CLAIM TO KNOW WHAT IS IN LAHUD’S MIND OR WHETHER, IN FACT, HE HAS A PROGRAM FOR GOVERNANCE. THE ROLE AND AUTHORITY OF THE POST-TAIF PRESIDENT IS ITSELF AMBIGUOUS. UNLIKE THE PRIME MINISTER AND SPEAKER OF THE PARLIAMENT, WHO HAVE CLEARLY DEFINED EXECUTIVE AND LEGISLATIVE POWERS AND PREROGATIVES, THE PRESIDENT — BY THE TEXT OF THE CONSTITUTION — PLAYS A LARGELY SYMBOLIC ROLE. PERSONAL CORRUPTION, LACK OF INTEREST AND LIMITED CREDIBILITY AS A NATIONAL OR INTERNATIONAL STATESMAN RENDERED CURRENT PRESIDENT HRAWI UNFIT OR UNABLE TO TAKE ON ANY LARGER, MORE EFFECTIVE RESPONSIBILITIES. MANY HERE ARGUE THAT LAHUD CAN INDEED ASSUME A SIGNIFICANT ROLE AS AN EXEMPLAR OF PERSONAL ETHICS IN GOVERNMENT AND, BUILDING ON HIS SUCCESS WITH THE LAF, IN REBUILDING AND REINFORCING THE INSTITUTIONS OF GOVERNMENT. SYRIA: WHAT DOES ASAD WANT? Link to the original cable on WikiLeaks. Posted in Lebanese Politics, Politics, Presidential Elections, WikiLeaks on January 15, 2015 by Ramez Dagher.